Over the years, it has become increasingly easy to gain access to you PC if it doesn’t boot or there is a serious problem with it meaning you can’t access the hard drives etc. A few years back, there were very few tools available to help you out, maybe something like the Ultimate Boot CD 4 Windows or an early version of Hiren’s Boot CD was around to help, but your choices were limited. One of the advantages Linux brought is that they had to try and get people, to have a look at their operating systems, so decided to actually put a functioning version of their operating system onto CD so you could try it out without installing it. An operating system that doesn’t need installing and stays on an external media such as USB or optical disc is called a LiveCD. Live refers to the fact that these disc based operating systems are self contained and run completely on their own without the need to interact with any installed operating systems. Files which need writing to a hard drive are simply stored in memory instead. Windows also has the Windows Preinstallation Environment (WinPE) which can also be used as a Live O/S, but obviously the commercial nature of Windows means there are a lot of licensing issues and grey areas about how a WinPE based LiveCD can be distributed and used. This is why the overwhelming majority of LiveCD’s are Linux based, and these days are used in just about every form of bootable USB or CD. These days there are hundreds of different LiveCD’s available for you to look at, and the good thing is you obviously don’t have to touch your current operating system to download and try them out. 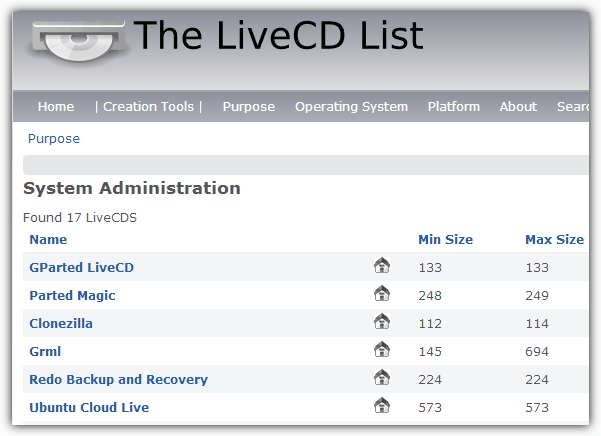 Whether you’re looking for a repair / recovery LiveCD or simply thinking about perhaps trying out a Linux distro, one of the most useful places you can visit is The LiveCD List. As the name implies, the LiveCD List catalogs and maintains a database of over 300 distro’s across a number of different operating systems including Windows, Linux, BSD and Solaris etc. They can also be split into categories which are listed as to the main purpose of the LiveCD and over 20 are available so you can filter the list to more suit what you’re looking for. For instance, the most populated purpose is Desktops and you will find things like Ubuntu and Puppy Linux which are more all round distro’s which can perform a number of tasks in a common desktop environment. Important purpose categories are Diagnostics, Rescue and System Administration because they contain the bulk of the tools useful to Windows users for recovering from crashes, drive failure etc. GParted, Hiren’s BootCD, RIPLinux, Clonezilla are the sort of things you will find. Also, not to forget the important purpose of Windows Antivirus which lists bootable CD’s like the Kaspersky Rescue disc and AVG Rescue CD. If you’re a computer technician or just the go to guy when it comes to fixing family and friend PC issues, a rescue LiveCD is very helpful to you and one of the most important discs you will carry in your toolkit. If their computer is unbootable, you can use a rescue LiveCD to access the files in the Windows install, then copy all the important files to USB flash or external hard drive. A big advantage of recovering from a Windows install using a Live Linux is they can often read from drives or partitions when Windows simply refuses to. If there’s 1 criticism of The LiveCD List it’s that not all distributions are up to date and CD’s such as antivirus are obviously updated regularly. 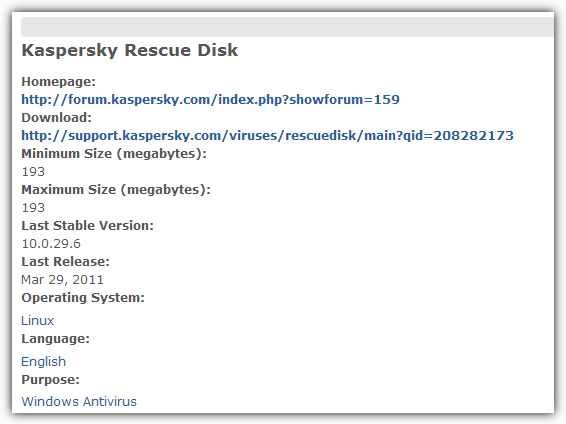 Something like the Kaspersky Rescue Disk is far more up to date than the release date in here tells us. Mind you, there are links to the homepage and download page to each Live distro on the website so it’s not too difficult to just click on a link to get the latest version. 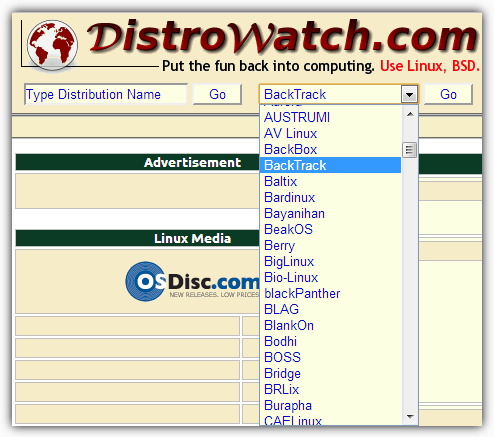 If you want to get more up to date information about the latest Linux releases, then another useful website for you to visit is DistroWatch. This site gives the latest news and release information for just about all Linux and Unix based distro’s, along with reviews and the popularity of each version for a given period of time. For instance, it told us Linux Mint is the most popular Linux around at the moment. Simply select your chosen distro from the drop down and you will be given a wealth of the latest information about it including links, news and details about previous releases. For a more statistical look at Linux distributions, there’s a comprehensive comparison page over a Wikipedia. excellent information – Raymond. since i found your blog, I’ve learned a lot of new things. AMAZING RAYMOND! You’ve done it again! Recently I visited your blog through the google search.. and now I am the regular reader of your blog. Trust me that daily at least 3 times I will check your blog for updates :) . Thanks for the information and till today I don’t see any other blog matching the content of your blog. raymond – i’ve been looking at your blog for a while. I just wanted to say – you rock.